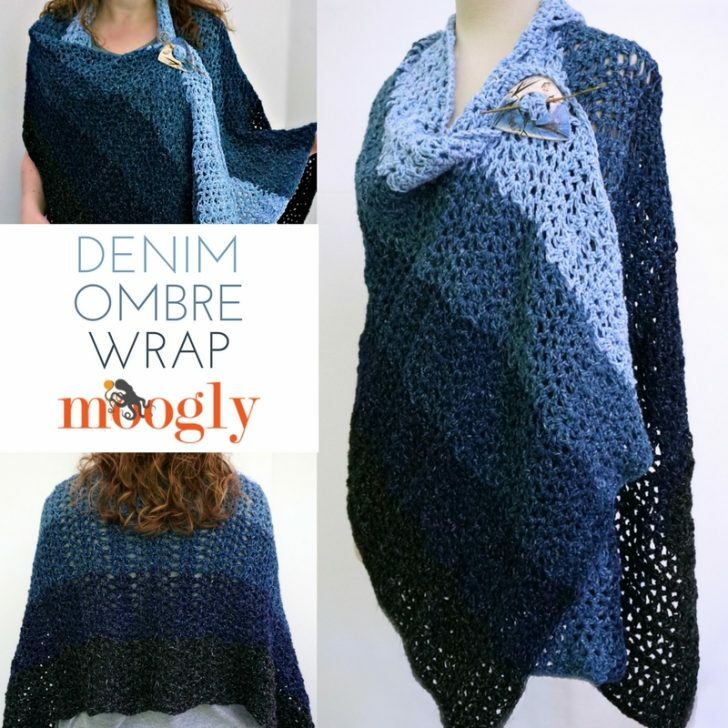 The Denim Ombre Wrap is super soft, crazy cozy, and a fabulously free crochet pattern here on Moogly! Disclaimer: This post includes affiliate links; Lion Brand provided the yarn for this pattern. 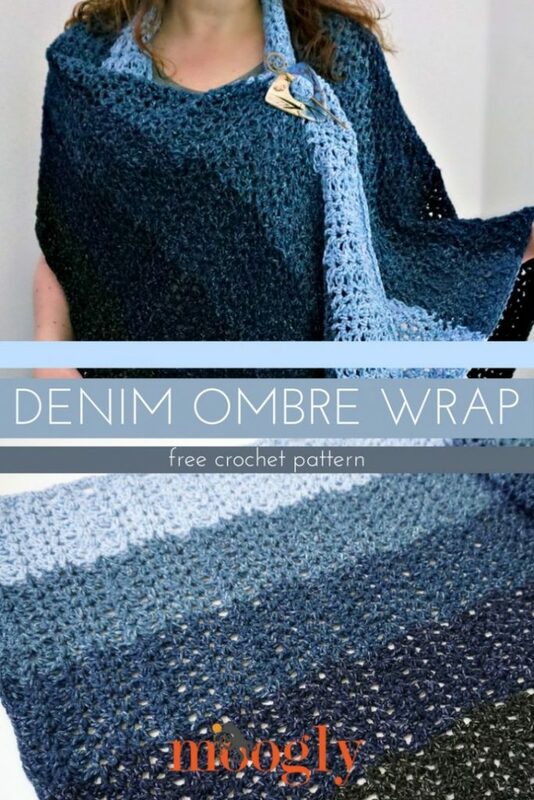 Inspired by gorgeous Lion Brand Jeans yarn and one of my favorite vintage stitch patterns, the Denim Ombre Wrap is so wonderful to crochet! The yarn is just as soft and plush as can be, and the finished shawl fits almost any adult. And the stitch pattern has this softly scalloped edge built right in. 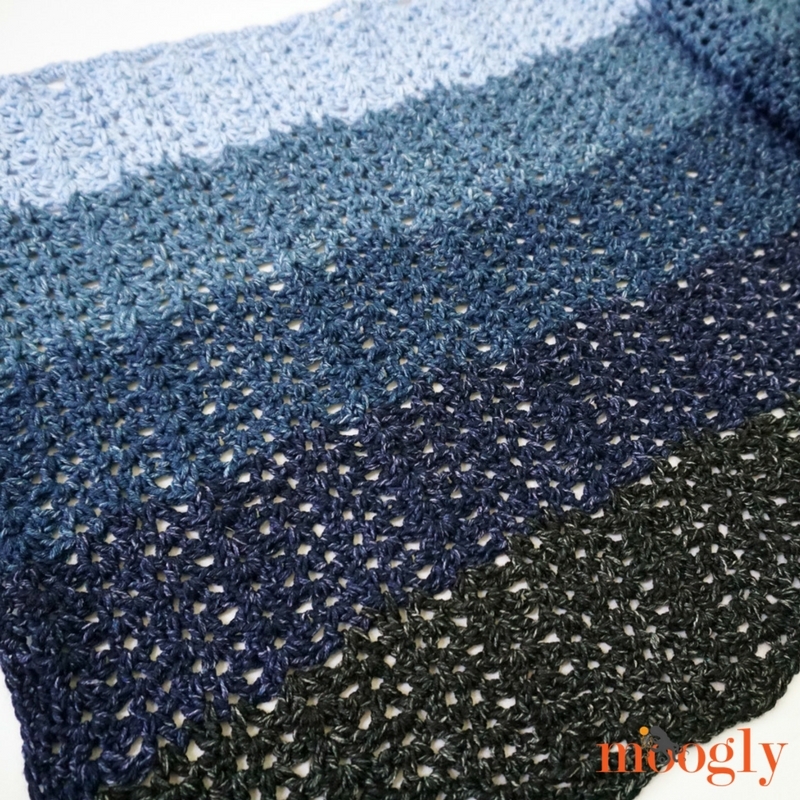 One of the unique features of this pattern is the way the yarn is set aside for the border – and the way you can make a multi-colored border without adding any more ends to your project! It’s all due to the use of long tails and butterfly bobbins. There’s a tutorial for how to make the bobbins below, and using them for the border like this is pretty darn smart if I do say so myself. 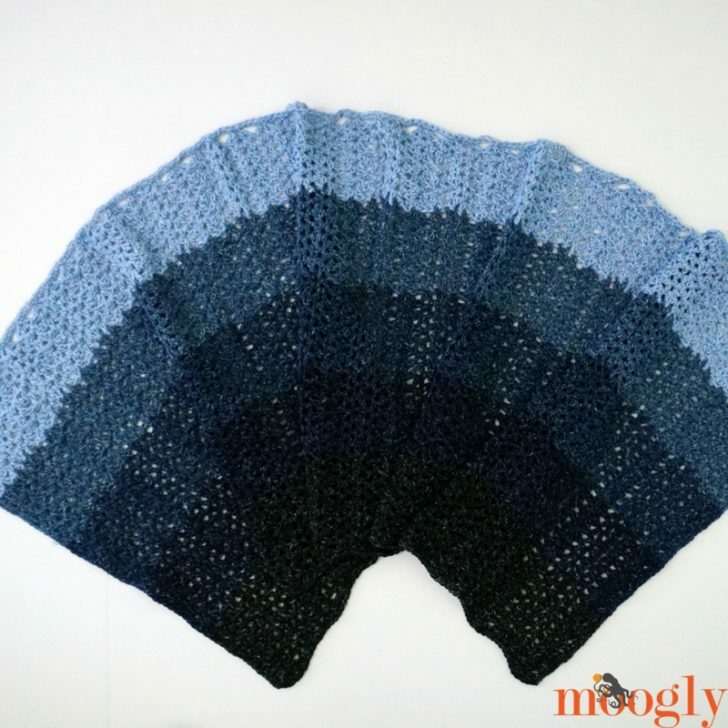 By leaving long tails at the beginning and/or end of each color section, you can use those tails when making the border. Here’s a picture of the shawl after Row 36, ready for the edging! Just use the butterfly bobbins to keep the ends neat and ready and waiting for you, and a stitch marker to hold the bobbin in place along the side until you’re ready for it. Add your border with no extra ends to weave in – I call that a perfect finish! Click here to purchase the yarn and pattern in a Lion Brand Kit! 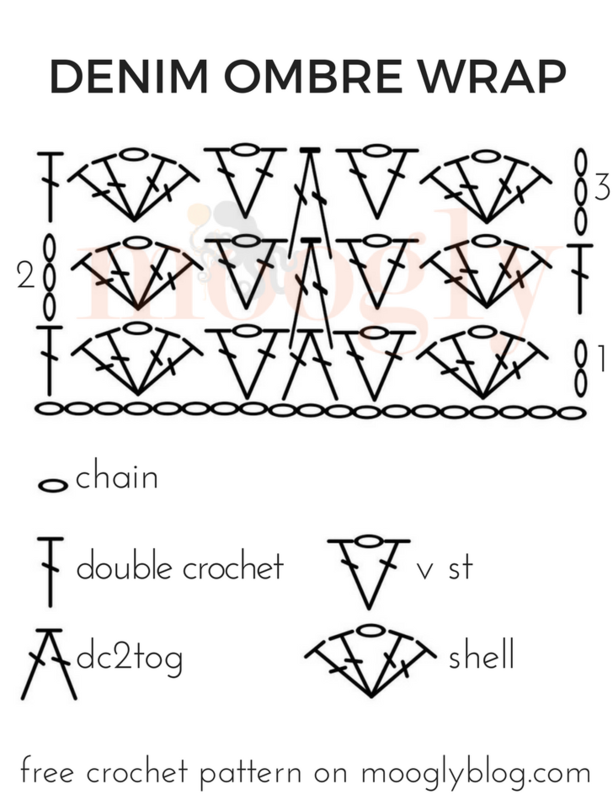 Row 2: Ch 3 (counts as first dc, may substitute chainless starting double crochet if desired), skip 2 sts, shell in the ch sp of the first shell, *v st in the ch sp of the next v st, dc2tog in between the posts on either side of the dc2tog of the previous round, v st in the ch sp of the next v st, shell in the ch sp of the shell; rep from * across, dc in the last st, turn. Row 3 – 7: Repeat Row 2; at the end of Row 7, break yarn leaving a 30-foot tail at the end (put into a bobbin), do not turn. Row 8: With Color B, leaving a 4-foot tail at the beginning, join to first st of Row 7 with a double crochet, skip 2 sts, shell in the ch sp of the first shell, *v st in the ch sp of the next v st, dc2tog in between the posts on either side of the dc2tog of the previous round, v st in the ch sp of the next v st, shell in the ch sp of the next shell; rep from * across, dc in the last st, turn. Row 9 – 14: Repeat Row 2; at the end of Row 14, break yarn leaving a 4-foot tail at the end, do not turn. Row 15: With Color C, repeat Row 8. Row 16 – 21: Repeat Row 2; at the end of Row 21, break yarn leaving a 4-foot tail at the end, do not turn. Row 22: With Color D, repeat Row 8. Row 23 – 28: Repeat Row 2; at the end of Row 28, break yarn leaving a 4-foot tail at the end, do not turn. Row 29: With Color E, repeat Row 8. Row 30 – 36: Repeat Row 2. Edging/Border (use bobbin-ed yarn tails for Color A – D): Continuing with Color E, ch 1, sc evenly across last row, ch 1 at the corner, sc evenly along the sides of the rows switching tail ends to match each section, ch 1 at the corner, continuing with Color A sc evenly across the foundation chain, ch 1, sc evenly along the sides of the rows switching tail ends to match each section, ch 1 at the corner; join to first st of Edging with sl st, break yarn. And that’s the Denim Ombre Wrap! It’s easy to care for acrylic, and just as easy to wear. Wrap it around your shoulders to ward off a chill, or around your neck as a big bulky scarf – it’s a great piece to have nearby all year round. I hope you enjoy making it! What a lovely wrap! Is there a way you would use a picture that actually shows the edging with the color changes; the pictures you post only really show the edge that’s from the bottom/top rows, while the sides are kind of blurry in the background or cut off. I’m sure I’m not unusual in being a visual learner who has an easier time when I can see a clear picture of the final product. Thanks for all the wonderful work you do!!! I love the way this shawl looks! I can’t wait to make it- it has moved to the top of my list after finishing some UFOs lol! Absolutely love this! Wraps are my new fave go-to’s for temperature changes inside and out. I can’t wait to try this one. It will go with everything…because I wear mostly jeans. Thanks so much for the awesome ideas in Moogly! I love your blog & newsletter. 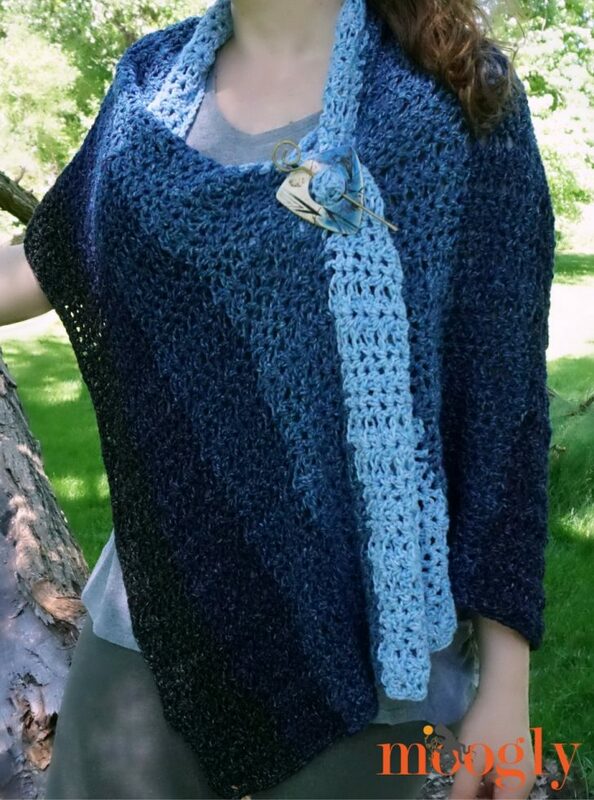 Where can I purchase shawl pin used in the denim ombré wrap? Hi Christine! It’s from Lickin’ Flames, linked above under the hook/yarn info! Thank you so very much Kate, I’m glad to hear it! Love everything about this wrap. Would like more info on how you switch yarn colors on the edging. 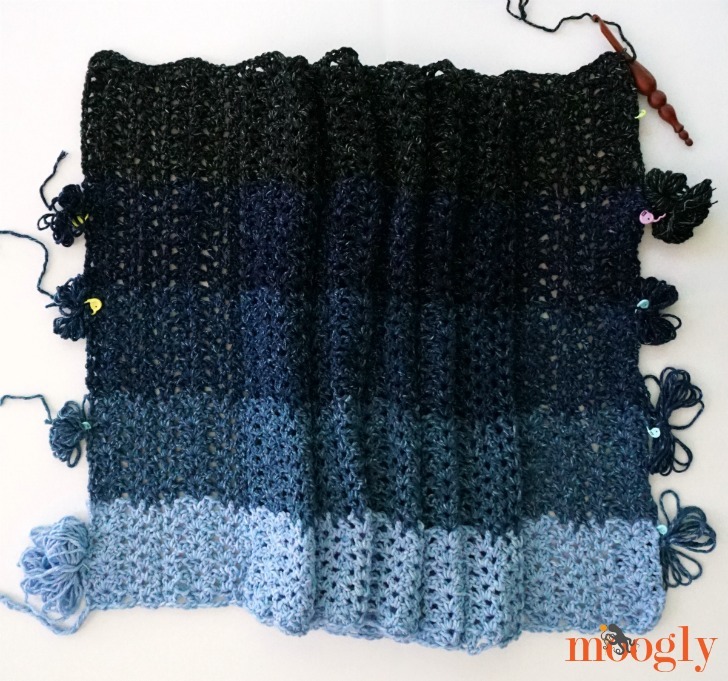 Do you follow the same procedure as when you change yarn colors in any crochet work? Do you tie a knot? Thank you. 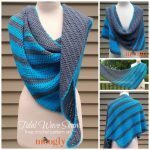 Hi Tamara – I saw a tutorial you did on the Lion Brand yarn sight about 4 weeks ago showing how to do a cascading shell stitch at the end of rectangular healing wrap using the Shawl in a Ball yarn. Since then I learned that a dear friend has cancer and thought I would make her a shawl using that pattern and that yarn. I have been searching all over your sight and back to the Lion Brand sight as well to no avail. Please help me find it. 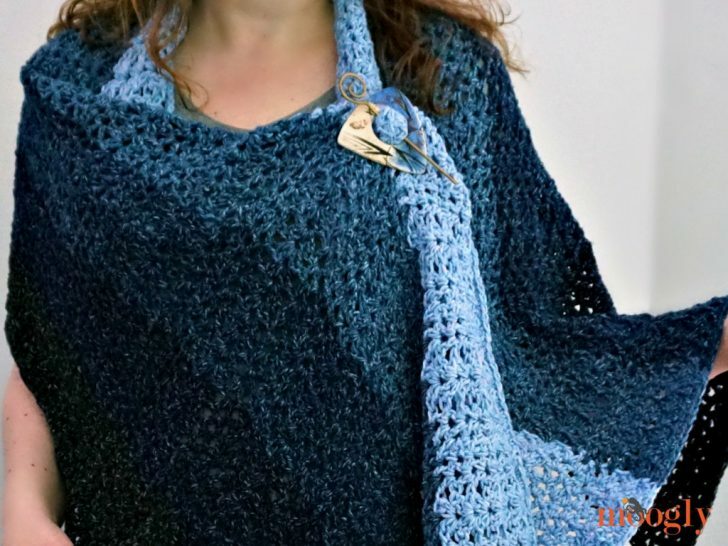 I know it starts with 52 chains, I believe it was in a shade of blue and as you finish the wrap it comes to a point using the shell stitch a beautiful eye catching finish!!! You made it sound SOOO easy – please help me locate it! I am very confused about this pattern. I purchased the yarn and pattern from Lyon Brand. I don’t understand what it means when you say “dc2tog over the net 3 ch (skip center ch). Do you mean dc2tog into the next 3 ch.? I don’t know where to go to get help with this. Yo and insert hook into next chain, yo and pull up loop, yo and pull through 2 loops (2 loops remain on hook), skip the next (second) chain, yo and insert hook in next (third) chain, yo and pull up loop, yo and pull through 2 loops (3 loops remain on hook), yo and pull through all 3 loops to finish stitch. Thank you for sharing this pattern. It is definitely one that I will do once I finish my WIPs. The colors are very beautiful and the overall wrap is gorgeous. Have a happy day. 😀 Thank you so much Chantal! 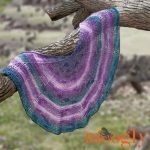 Would it be okay for me to sell a shawl I made from this pattern as long as I gave the link to this website? That would be great! Thank you – and good luck with your sales!